In the last five years, the bump in display resolution from WXGA (1366 x 768 pixels) to Full HD (1920 x 1080 pixels) has been one of the most notable upgrades to the average mainstream laptop in the Rs 40,000 – 50,000 price bracket. Now, the next big gradual upgrade is coming to everyday laptops in the form of fast storage, something much needed on most laptops under the Rs 50,000 mark. Though not the first to do it in its price range, the HP Notebook 15 brings with it a 256GB PCIe solid-state drive. The tiny but speedy Toshiba SSD seems to make all the difference on the otherwise banal HP laptop. 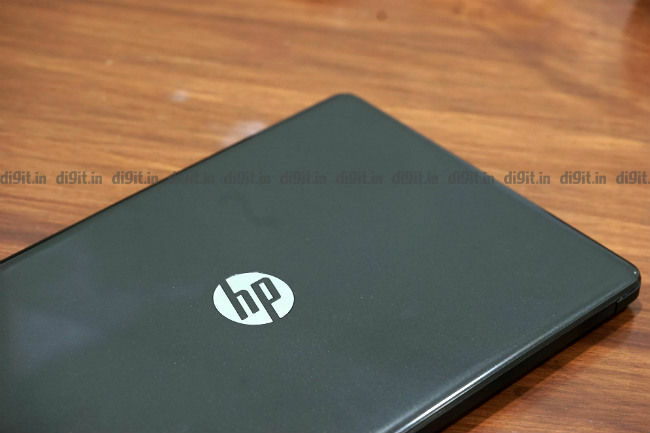 Read on to find out how the HP Notebook 15 did in our review. One look at the HP Notebook 15 is enough to say it belongs in the backpack of a young student or a novice programmer. The laptop features a no-frills plastic construction all around with a sparkling glossy finish for the top cover, which means smudges and fingerprints are most welcome. The centre of the top cover may sport a bold HP logo in chrome finish but isn’t the place to keep anything heavy (like a full water bottle) as it flexes easily. The HP Notebook 15 requires a firm grip and some muscle to be carried around because the glossy body can be slippery and weighs two full kilogrammes. 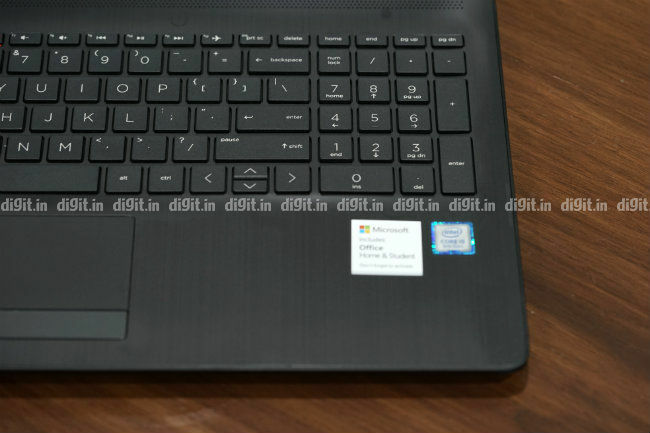 Pushing open the laptop lid, which can be done with just one finger, reveals a 15.6-inch matte display with thick borders all around and a boring grey keyboard area with a brushed finish. 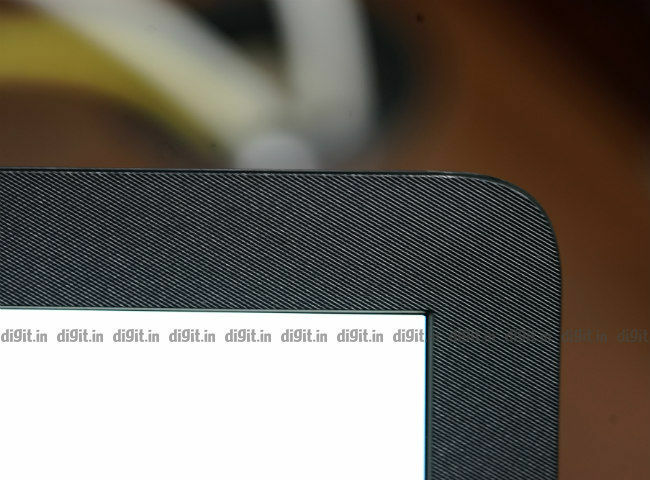 The light knurling of the bezels around the display is probably the only touch that lends the laptop a premium feeling. The HP Notebook 15 is otherwise as attractive as say, a box of tissues. In my review of the Asus F570, I’d complained that the display suffers from low contrast and that the manufacturer had seemingly forgotten to add colours to the laptop’s display. Well, the exact same seems to be true of the HP Notebook 15 as well. 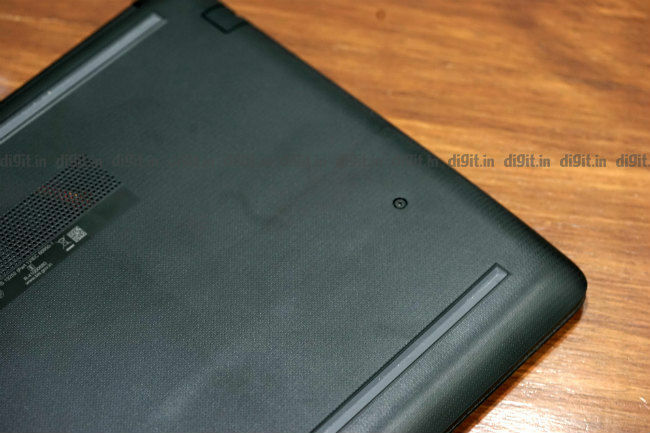 The 15.6-inch non-touchscreen display features Full HD resolution and 220 nits of maximum brightness but lacks contrast. The white from the backlighting dulls the colours on the display, thereby reducing overall display quality considerably for activities like web browsing and movie-watching. 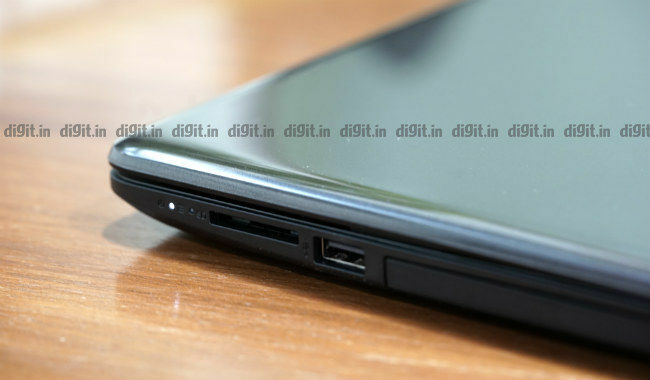 What’s more, there’s no dedicated graphics on board for the half a lakh rupees the HP Notebook 15 commands. Sound from the HP Notebook 15’s upward-firing speakers can, at best, be termed underwhelming. There isn’t sufficient volume, so listening to music or taking a VoIP call even from a small enclosed cabin is sometimes a strain. When the volume is turned all the way up, music sounds tinny with no stereo separation or spatial effect. Bass sounds muffled and the mids aren’t deep enough either. As a result, vocals sound more flat than they actually are. The same is felt when listening to instruments like the trumpet and the violin. In summary, the speakers on the HP Notebook 15 are best reserved for those tiny error dings you hear in Windows. 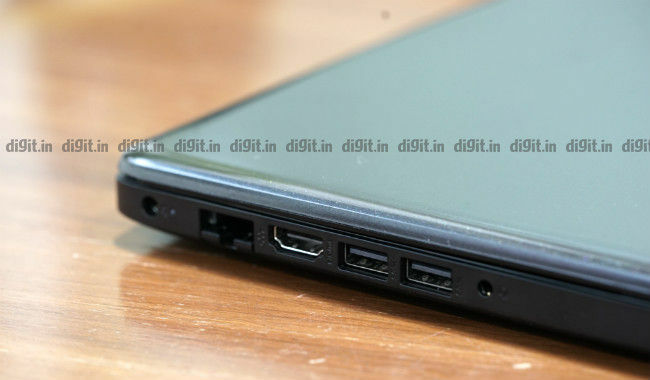 There are plenty of ports on the HP Notebook 15. On the left side, we see the round-pin power port, LAN port, full-size HDMI, two USB 3.1 ports, and a 3.5mm audio jack for headsets. On the right side, we see a single USB 2.0 port and an SD Card slot. There’s also a Kensington MicroSaver lock slot to secure the device and an optical disc drive for CDs and DVDs, in case you still use those things anymore. What’s missing, sadly, is a USB Type-C port and a fingerprint scanner. 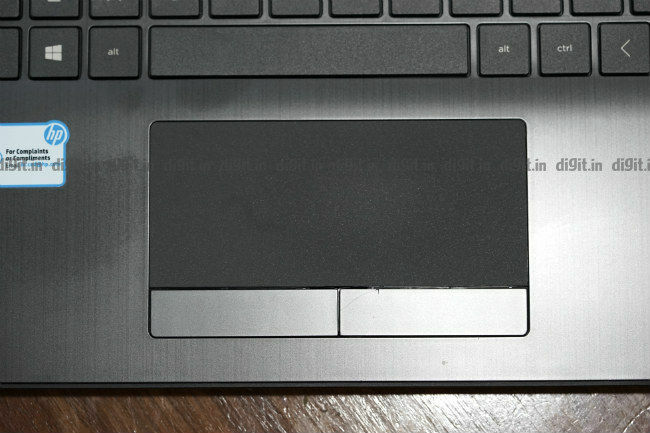 The HP Notebook 15 features a standard keyboard with a numpad on the side. The keys have the right amount of resistance and size but lack travel and backlighting. What’s more, the keys on the top row are a bit too narrow for comfort. Luckily, there are individual keys for Home, End, Page Up, and Page Down functions. Though it’s a fine setup for short emails and code, the Notebook 15’s keyboard is no good for long documents. The touchpad experience on the HP Notebook 15 is underwhelming. The unit does not use Windows 10’s precision drivers, so you can forget the multi-touch taps and gestures the operating system offers. What you get instead for tweaking the touchpad is Synaptics’ proprietary tool, which lets you use three- and four-finger taps but not modify them. There are separate buttons below the touchpad for left and right clicks, which get a little hard to press from time to time. To sum it up, you’ll want to add a reliable three-button mouse to the cart at the time of buying this laptop. This is one department in which the HP Notebook 15 fares better than most of the competition out there, and I’ll tell you why too. It has an 8th Gen Intel Core i5 CPU and 8GB of RAM but most importantly, it has a proper solid-state drive for storage. Ditching the traditional 5,400 rpm hard drive for a fast 256GB Toshiba PCIe SSD is probably one of the smartest decisions HP has made in the last few months and it shows in the real-world performance of HP Notebook 15. What’s sorely missed is the presence of a dedicated graphics card. For the price tag the HP Notebook 15 carries, an NVIDIA GeForce MX150 card with 2GB of vRAM would not have gone amiss. Instead, it gets Intel integrated graphics. On our standard benchmark tests, the HP Notebook 15 review unit fared decently. It outscored the AMD Ryzen 5-powered Asus F570 by 430 points in PCMark 8’s Accelerated Creative Test and by 1,145 points in PCMark 10. 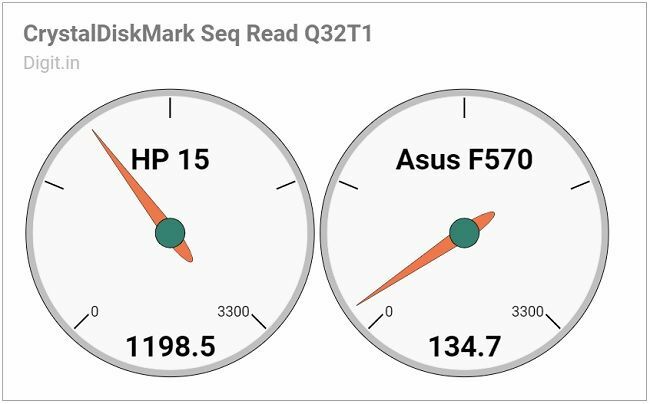 More notably, the solid-state disk on the HP Notebook 15 proved to be ten times faster than the sluggish hard drive on the Asus F570 in sequential read tests and nearly six times faster in sequential write tests. The speed advantage was seen in nearly every computing activity, including booting, opening up context menus, and launching applications. There was absolutely no lag or stutter while switching between moderately heavy applications such as Microsoft PowerPoint, Google Chrome, iTunes, and Paint 3D. I was able to open and use over thirty instances on Chrome across multiple desktops without any trouble. What may be a dealbreaker for most users is the low storage capacity offered by the solid-state drive. But what it lacks in capacity it makes up for in speed by a huge margin. If you get easily annoyed by lags and stutters in window animation (like me), you should consider the SSD-powered HP Notebook 15 seriously. Don’t expect to game on the laptop though; its integrated graphics chip is no good even for light games. Another plus point about the HP Notebook 15 is its ability to stay cool under pressure. The average temperature of the CPU package doesn’t cross 45 degrees Celsius even when the cores are loaded. In summary, the HP Notebook 15 is ideal for hours of web browsing and video playback. If you quickly want to pull your laptop out to check data, you can count on this laptop. The battery on the HP Notebook 15 is surprisingly long-lasting, given its price. On the review unit, I turned the brightness up to 80 percent, enabled Wi-Fi and Bluetooth , and opened up a score of applications (including iTunes, which played music continuously) and watched the battery drop from full to 44 percent in three hours. 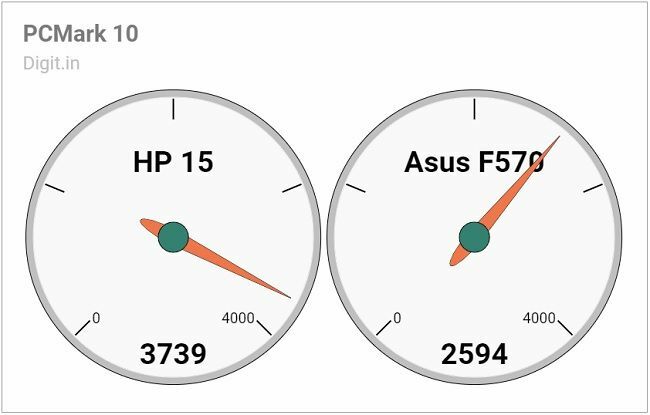 On our standard battery benchmark test, the HP Notebook 15 lasted 3 hours, 25 minutes, which is eight minutes over the Asus F570’s score on the same test. In summary, the battery life on the HP Notebook 15 is decent. Expect an average of five hours of continuous use on a single charge on this laptop. Even if it hurts a little, the truth about the HP Notebook 15 is that its performance really is the only thing that sets it apart from the crowd, and that comes courtesy of the 8th Gen Intel Core i5 chip and the speedy solid-state drive inside. The ample RAM definitely helps as well. The battery life is a decent five hours but could have been longer. Otherwise, there’s nothing special about it. You’d find this sort of body construction and underwhelming display on a laptop that’s even half its price. That said, if you think about it, performance is what usually matters most to the average laptop buyer. So, if you’re that sort of buyer who can forgive a mainstream laptop for lacking a lot of things like USB Type-C, keyboard backlighting, and dedicated graphics but simply can’t do without speedy performance, then the HP Notebook 15 is definitely for you. Buy it with your eyes closed.